I’ve been dying to get out to sea and view the Rampion Windfarm that starts 12km off our coast. Way back in 2013 when I was selected as a candidate here I announced my support for it, and since then I’ve done all I can to make sure it was developed sensitively and as beneficial to our community as possible. I am totally passionate about renewable energy and I’ve sued this project to learn more not only about the technical side of wind generation, but about what it takes to make it a reality. So last year I travelled up to Edinburgh to visit the head office of the Green Energy Bank. They used to be a public investment agency (now it’s been privatised…) and they put the final £250m to make this £1.3bn project a reality. I’ve also met numerous times with the managers that have made this astonishing project happen, right up to the CEO of E.on. 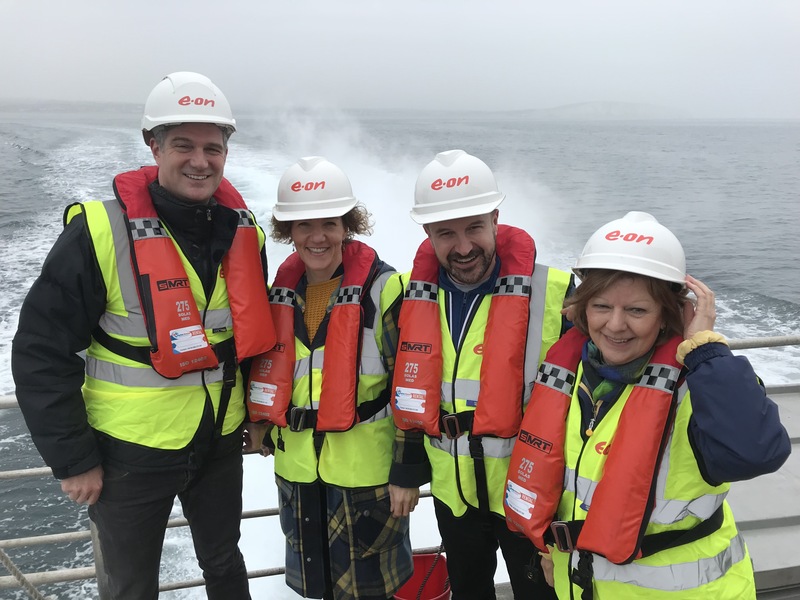 Recently the CEO and much of his senior team came down to Sussex and took me out to visit the farm out at sea. My team were so excited and fascinated at the thought there was no way they were letting me head out there alone so we all went along together. Stella, who heads up the casework here in Hove, is also a solar energy campaigner who campaigned to have an array put on one of our local schools. It was brilliant to see her grilling E.on executives as we made our way out to sea! The farm is stunning to see up close, but it’s really hard to get a sense of the scale of it even when you’re standing underneath the blades as they’re spinning. So get this: when the blade it at it’s highest point it is several metres higher than the pod goes on the i360. From land the turbines look closely packed, but in fact they are half a kilometre apart. There is a lift in the shaft of each windmill to take engineers to the top. In the housing at the top there’s enough room for the gearing and generators, and should the weather change and it not be possible to retrieve the engineer once they’re onboard, then there’s enough room for them to bed-down and spend the night there right at the top! And it’s really high-tech too. A beam of something (it’s too scientific for me!) is sent out from the top of each turbine into the distance that detects changes in wind direction and adjusts the position of the turbine so that it’s perfectly positioned at the exact moment the wind arrives to get optimum efficiency. There’s a dedicated apprenticeship programme so local youngsters benefit from this amazing investment and most of the jobs running and maintaining the installation are from the Sussex area. I didn’t realise, stupidly, just how much maintenance the turbines need to keep running. The wear and tear on the gearbox and generators is huge in performs of consistent wind. So far there’s only one female engineer out there working the turbines, but hopefully that will grow in time. It was great to have the E.on boss, Mike, out there with us. The company has now closed all of it’s coal power stations and is focussing 100% on non-carbon electricity generation. 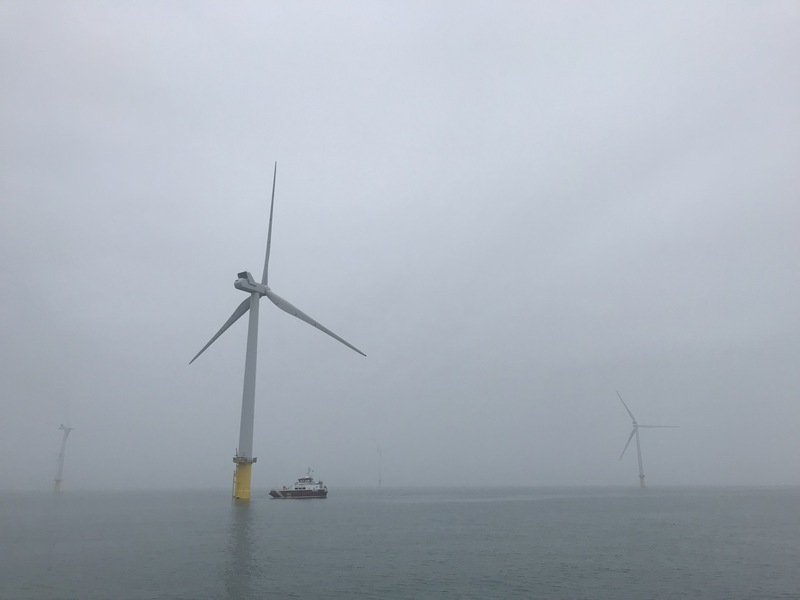 The Rampion wind farm alone is now producing about a third of the electricity requirement to fulfil a third of East and West Sussex’s households combined. This is great news. Wind power is sometimes controversial. Marine conservation is an issue, in this case construction paused for four months a year to allow a rare fish to spawn undisturbed, and now that construction has finished fish stock is still at normal and fishing is allowed as per normal so our local fishermen are not affected. Some people have complained about the obstructed view of the seascape. Several people have contacted me asking that I try and have the whole thing taken down! But I have to be honest, I love this project and I’m immensely proud of it. Too often in cities we are divorced from where our energy comes from, we have no relationship with it. That’s changed for us now and we as a community can say that we’re doing our bit to keep the lights on but in an environmentally sustainable way. The next massive push we need as a country is on energy conservation. Almost half of the energy we consume as a nation goes on heating. We are one of the least heat efficient countries in the whole world and that must change. We must have a Victorian-scale programme of upgrading our housing stock to become more efficient and that’s something I am going to be speaking a lot more about in the future. I’ll also continue to comapaign for better support for micro-generation on our own homes. Solar and battery technology are about to transform how we can be more sustainable as households and this is hugely exciting.